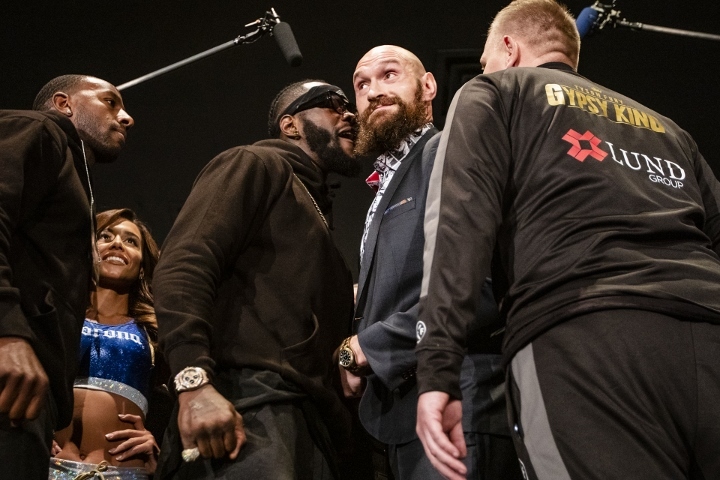 Any promoter holding out hope to win a purse bid hearing for the ordered rematch between Deontay Wilder and Tyson Fury will have to wait at least one more week—and likely to watch the fight taken off the table. The World Boxing Council (WBC) officially postponed a scheduled February 5 purse bid hearing dedicated to Wilder-Fury II, upon the request of both sides who are believed to on the doorstep of finalizing terms for their highly anticipated sequel. “The WBC has extended the free negotiation period for Deontay Wilder vs. Tyson Fury as both parties requested time to finalize a deal,” WBC President Mauricio Sulaiman stated Monday evening. The free negotiations period and accompanying February 5 deadline was ordered in mid-January, shortly after the WBC officially approved plans for the sequel to their 12-round draw in Las Vegas. Wilder (40-0-1, 39KOs) scored a pair of late knockdowns to salvage the 8th defense of the title, albeit in a widely disputed draw verdict which many felt should have went to Fury. Regardless, the official outcome left the unbeaten 33-year old from Tuscaloosa, Ala. with his title intact, and recently celebrating four years as champ dating back to a Jan. ’15 points win over Bermane Stiverne. Those two bouts mark the lone occasions in Wilder’s career in which he’s been forced to go to the scorecards. Fury remains the only opponent over which he’s yet to score a stoppage win, having battered Stiverne inside of one round in their Nov. ’17 rematch. To his credit, Wilder has been eager to do it all over again from the moment the final bell sounded, focusing squarely on securing a rematch. For his part, Fury (27-0-1, 19KOs) remains fighting fit and awaiting his marching orders for his next ring adventure. The 30-year old Brit gained accolades both for his performance along with his triumphant ring return last June, following a 31-month absence during which time he battled substance abuse and mental health issues all while having ballooned to as heavy as 400 pounds during one point. The fall from grace left Fury without his slew of alphabet titles he collected from a Nov. ’15 upset win over Wladimir Klitschko, who’d reigned for more than 9 ½ years before dropping a clear-cut decision in their high-profile affair in Germany. A rematch was due to take place in England in 2016, only for Fury to twice postpone and ultimately cancel in getting his house in order. A pair of tune-up wins last summer paved the way for Fury to maneuver towards his first figh with Wilder. The fact that he made it that far was widely celebrated, with his terrific boxing performance capping what was universally hailed as the 2017 Comeback of the Year. His rising from the canvas in round 12 was nothing short of miraculous, Not only did Fury recover from the second knockdown of the bout, but less than a minute after having believed to have been knocked out went back to mocking and taunting Wilder as if he’d once again seized momentum. The Showtime Pay-Per-View event played to a crowd of more than 17,000 in attendance at the Staples Center, drawing in the range of 325,000 buys which was regarded a commercial success especially considering it was the first U.S. PPV headliner by either boxer. The rematch plans to be even bigger and now has a little more time to finalize terms. As previously reported by BoxingScene.com senior writer Keith Idec, the sequel will likely take place at Barclays Center in Brooklyn, New York. The two working dates are April 27 and May 18, with the latter date the more likely scenario. Chances are, the boxing world will be all caught up within the next seven days or so—whether through a finalized deal or at a February 12 purse bid hearing.